NEWS UPDATE. The first article of the Radio Design & Construction series about a hybrid valve/transistor 20 & 80m AM/USB/LSB receiver is now ready for purchase at a cost of £2.50 direct to my bank or £2.85 to my Paypal email address antony.nailer@talktalk.net The first article of the Understanding Radio series about Op Amps is still available at a cost of £2.00 to my bank or £2.35 to my Paypal account. In the future I also intend to rework the last 20 something articles of Technical for the Terrified into a book called Understanding Radio Book 3. 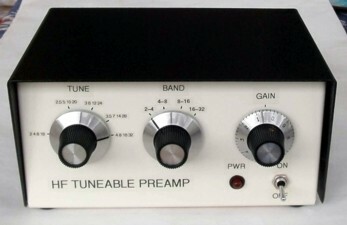 The HF TUNEABLE PREAMP has now been reworked to cover the full range of 1.8-30MHz. A new 118-400MHz PREAMP available in 12V DC or mains powered versions for Scanner users have now been introduced. MY RETIREMENT AS AUTHOR FOR PW. In the Editorial in November issue PW the Editor has stated that I am unable to submit articles for the foreseeable future. This is not true! I am quite capable of submitting articles for Doing it By Design and for Technical for the Terrified BUT the Publisher for the new owner is unwilling to even discuss a requested small increase in my remuneration nor the shared copyright agreement and arrangement I had with the previous owners. The Editor has further threatened that he will find other authors for my series and may not then be in a position to accept submissions from me. Considering the attitude taken by the Publisher and the Editor I will not be unhappy to retire as a PW author. As I have received no communication from the Publisher or Editor since early September it is clear they are no longer interested in my contributions. I had not contemplated a retirement BUT having done this every month, with the exception of just two or three issues, since 2004, consuming on average in excess of 1/10 of my time I was always on the go. 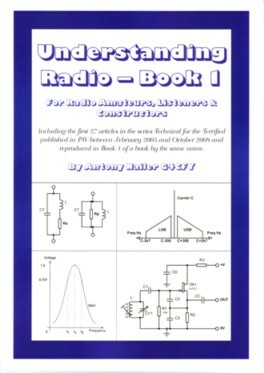 Understanding Radio Book 1 is a re-write of the Technical for the Terrified Book 1 published by Practical Wireless and compiled from 27 articles of that name previously published in PW Magazine between February 2005 and October 2008. The first chapter is a short revision for everyone who has not used algebra since leaving secondary or grammar school. It should also be useful to youngsters still at school and trying to get to grips with it. The articles have been reworked into chapters so there is now a natural progression of information through the book. All the circuits have been redone and a lot of wasted space and unnecessary comments removed. It runs to 112 pages, which is 10 less than the T4T Book 1 but there is a lot more in it. The writing style is aimed to be easy to read and should be of great value to readers of all technical levels. Subjects include; Algebra, Resistors & Ohm's Law, Diodes and Rectification, Transistors - FETs & Valves, Transistor biasing, Amplifier Classes of Operation, Reactance & Resonance, Parallel Tuned Circuits, Bandpass Coupled Pairs, Small Signal Bipolar RF/IF Amplifiers, Small signal FET & Mosfet RF/IF Amplifiers, Oscillators, Mixers, Decibels, Modulation Modes, TRF & Superhet, Filtering in HF & VHF Receivers, Modes & Demodulation, Choosing RF - IF & LO, Phase Locked Loops, PLL in CB & 10M rigs, Antennas & Feeders. Price £15.33 to my personal Paypal account antony.nailer@talktalk.netor through Spectrum, £14.50 by direct transfer to my bank. Spectrum Communication purchased Garex Electronics on 1 December 2011 from Peter Longhurst. The purchase included the sole manufacturing and selling rights to the 2001, 4001, 6001, & 7003 range of FM transceivers, preamps, wire aerials, flexi-whip handheld aerials, rigid mono-band and dual-band mobile whip aerials and interference filters. Many of the products have since been improved or completely re-designed. The VHF and UHF bands are dominated in the UK by broadcast FM radio in the range 88-108MHz and by broadcast TV from 550MHz up to about 900MHz. Any preamp that is wideband enough to include wither of these broadcast bands is likely to overload and then not be able to amplify the low power communications in the range 110-500MHz. This mains powered preamp includes quite sharp high pass and low pass filters that allow it to safely amplify the low power signals within its passband without overload. It is housed in an unpainted diecast box 120x95x34mm with BNC sockets and a 1 metre mains lead and plug. Ready Built only, £59.50 including insured and tracked carriage by Hermes. This is the version that is powered from an internal PP3 battery. It uses the same board amplifier boards as the mains version and will typically give 20 hours battery life from a zinc carbon battery but up to 100 hours continuous use with an alkaline battery. Ready Built, £48.50 including insured and tracked carriage by Hermes. 1.8 - 30MHz. Configured in 4 bands, Band A 1.8-3.8MHz, Band B 3.8-7.6MHz, Band C 7.5-15.0MHz, & Band D 15.0-30.0MHz.. Band A gain is 10dB at 1.8MHz rising smoothly to level off at 16dB at 3.5MH to 3.8MHz. Band B gain is 10dB at 3.8MHz rising smoothly to 16dB at 6.6 to 7.6MHz. Band C gain is 11dB at 7.5MHz rising smoothly to 16dB at 13.5MHz to 15MHz. Band D gain is 7dB at 15MHz rising quite steeply to 15dB at 21 to 30MHz. Gain adjustable down to -20dB. Runs from external 12 or 13.5VDC at 20mA via a 2.1mm DC connector. input and output RF sockets are SO239. Two-part stove enameled box 150x100x75mm. Weight 410gms. Box kit £58.50 UK, £68.00 EU, £72.00 World. Ready built £102.00 UK, £110.50 EU, £114.50 World. Prices include tracked carriage. CLASSIC (2) RECEIVER BOARD. 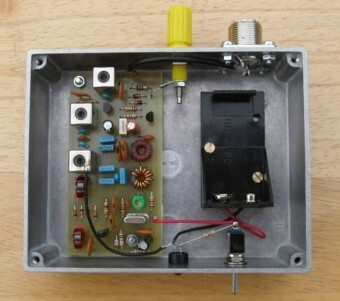 This is an SSB /CW receiver complete with the exception of local oscillator and front end band filter. It uses push-pull FET mixer, a 6 pole crystal 9MHz (or 10.7MHz) IF filter, two MC1350P IF stages, an FET product detector, crystal carrier oscillators and a TBA 820M audio amplifier. It has 120dB AGC range and S meter output. It can be used with a 5-5.5MHz VFO and switched front end filters for 80 and 20m operation. PCB and data only £16.00 UK, £17.00 EU, £18.00 World. PCB & parts kit £64.00 UK, £70.75 EU, £71.75 World. PCB built & tested £85.50 UK, £91.75 EU, £92.75 World. Prices inclusive tracked carriage. 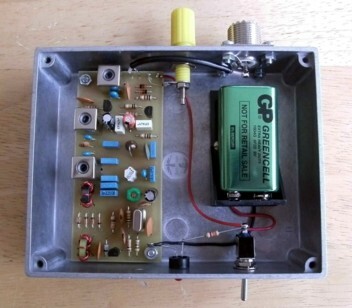 REGENERATIVE RECEIVER (G3RJV-G4CFY). This is my development of the circuit described by George Dobbs G3RJV in April 2013 PW. It comprises an FET infinite impedance detector and a conduction controlled Q multiplier or oscillator to enhance AM reception or receive and decode SSB signals. It also includes an IC audio amplifier to drive a loudspeaker. Version A 1.8-3.8MHz uses 45u0H coil. Version B 3.5-7.5MHz uses 11u0L coil. Version C 7.0-15.0MHz uses 2u6L coil. Version D 11.0-23.0MHz uses 1u2L coil. PCB & data £7.50 UK, £8.50 EU, £9.50 World. PCB kit £14.00 UK, £15.50 EU, £16.50 World. PCB kit and pots & polyvaricon £24.00 UK, £24.00 EU, £24.25 World. PCB Built with pots & polyvaricon £32.50 UK, £36.00 EU, £36.50 World. Prices include tracked carriage. Knobs and phono socket NOT included. 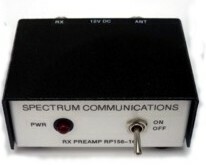 This version is designed for an input of 5kHz - 500kHz and converts is up to 4.005 - 4.500MHz. It has a high input impedance to suit any random wire aerial. A 500kHz elliptic low pass filter selects the input range, then a diode ring mixer, a crystal oscillator, and a bandpass filter at IF centred on 4.25MHz. The gain peaks at mid band at about 10dB falling to 3dB at 25kHz and 500kHz. There is an SO239 coax output to the receiver and 4mm terminal post for aerial wire. It runs from an internal PP3 battery. Box kit £53.50 UK, £59.50 EU, £62.00 World. Box built £72.00 UK, £80.25 EU, £83.00 World. Prices include tracking. 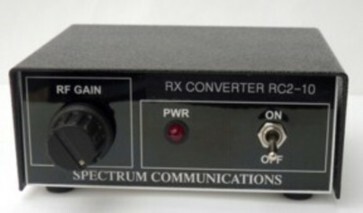 VLF CONVERTER 100Hz - 100kHz. Converts up to 4-4.1MHz. High input impedance to suit any random wire aerial. 100kHz elliptic low pass filter for input range, diode ring mixer, crystal oscillator, bandpass filter at IF centred on 4.05MHz. Gain 8dB at band edges and 12dB mid band. SO239 coax output to receiver and 4mm terminal post for aerial wire . Runs from an internal PP3 battery. MULTIBAND SYNTHESIZER. Designed to use as a 12 band local oscillator for a multiband HF receiver using a 5.0-5.5MHz tuneable IF. This board can also be used as a development and educational tool to explore the operation of phase locked loops. For ease of use it is programmed by means of a diode matrix, not requiring knowledge of PIC or EPROM or Arduino programming and also keeping down power consumption. The board as supplied has three voltage controlled oscillators tuning 7.0-9.3MHz, 12.0-16.5MHz, and 19.0-25.0MHz. As supplied it is set for 100kHz frequency steps but can easily be modified for 50kHz, 25kHz, or 10kHz steps. It operates from a 13.5V bench supply drawing less than 50mA. The output RF signal is a good sine-wave of amplitude 1.5V p-p.
PCB kit £57.50. PCB built and operational £85.50. G4CFY 5 & 10 BAND FRONT-END FILTERS. Triple bandpass coupled receive filters. DC diode switched with 5 bands to a board. Kit 5A 80/40/20,15, & 10m. Kit 5B 160/60,30/17/& 12m. Insertion loss below 5dB on all bands. Switching DC resistance 1k Ohms, draws 8mA from 8V or 12mA from 12V. Two boards can be interconnected for 10-way band switching. board size 92 x 84 x 15mm. One PCB 5-band kit of parts £38.50 UK, £42.50 EU, £43.00 World. Single PCB built £53.00 UK, £57.00 EU, £57.50 World. Two PCB 10-band kit of parts, £64.50 UK, £71.50 EU, £72.50 World. Two PCB built £98.00 UK £104.50 EU, £105.50 World. Prices include tracking. TARGET HF3 AM/SSB COMMUNICATIONS RECEIVER This is a masterpiece of RF engineering, covering 30kHz to 30MHz, which is includes the traditional Long Wave, Medium Wave, and Shortwave bands. There is a large tuning knob coupled to a flywheel to give easy smooth tuning. When turned slowly the frequency changes in 1kHz steps. When turned faster it goes in 10kHz steps and when spun faster still goes in 100kHz steps. There is a clarifier control to fine tune the receive frequency and of particular use when receiving single sideband stations. 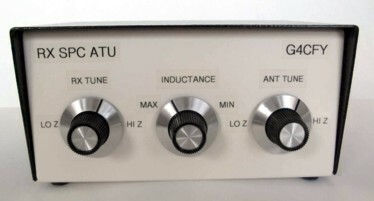 The radio automatically selects a 6kHz bandwidth filter when the mode is used to select AM. It uses a 3.8kHz filter when the mode switch is used to select Upper Sideband or Lower Sideband. The MEM button can be pressed to store a frequency and while in memory mode the main tuning dial can be used to view each of the stored frequencies. There is also a recall button which return the frequency to the last one stored. The receiver uses a first intermediate frequency of 45MHz and has a high side synthesized local oscillator providing exceptional stability. A large clear liquid crystal display shows the receive frequency to a resolution of 1kHz. The audio amplifier can produce up to 2W rms audio drive to the large internal loudspeaker. There is also an audio output phono connector sampling detected audio, prior to the volume control, that can be connected to the sound card of a computer. Various Features. Minimum discernable signal: AM 30kHz - 15MHz 2.5uV, 15MHz - 30MHz 4uV. SSB 30kHz - 15MHz 1.5uV, 15MHz - 30MHz 2.5uV. Phono antenna connector. DC connector with 2.4mm pin. 2W audio output. Power requirement DC 12/13.5V at up to 300mA. Dimensions 185x65x190mm. Weight 1.3kg. Supplied with a random wire antenna, a DC power cable with in-line fuse and 2.4mm DC line socket. Spectrum provides also a BNC to phono adapter. Please note, this is the only piece of equipment we sell that is not made by us. Nevertheless I believe it is the best value for money receiver presently available to listeners. The sensitivity is not particularly good and would benefit from the addition of the Spectrum HF Tuneable Preamp. Receiver £189.00. Receiver and HF Preamp £289.00. Receiver & low noise PSU 12V 500mA £213.00. Prices include tracking & insurance. 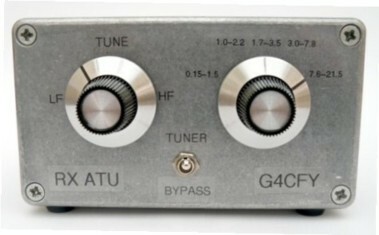 HF 4 BAND CONVERTER. Converts the 3 WARC bands and the 60 metre band to the range 13.89-14.41MHz. Suitable for use with older original amateur band receivers. Bands A-C all read correct with the kHz in the range 14.068-14.409MHz and band D reads the kHz correct from 13.89-13.99MHz. Normally supplied with SO239 sockets for ANT and RX. Two-part stove enameled box 150x100x75mm. PCB kit £57.00, PCB built £79.00. Box kit £89.50, Ready built £141.00. Prices include tracked carriage. For short random wire end fed aerials. Gives improved signal strength and lower receiver noise from 200kHz to at least 21MHz depending on wire length. Diecast box 114x64x55mm. Fitted with terminals for aerial and earth inputs, and phono or BNC or SO239 coax output. Includes a switch for tuner or bypass. State required output connector when ordering. Boxed kit £34.50 UK, £40.25 EU, £42.75 World. Ready Built £43.25 UK, £49.25 EU, £51.75 World. Including tracking & insurance. For all types of antenna, except short random wires. It has an SO239 socket for coax inputs and a binding post for direct random long and short wires. It works from 1MHz to 32MHz and will tune high and low input impedances and provide a low impedance output via an SO239 socket to the receiver. Housed in a two part stove enameled aluminium case 150x100x75. Price £59.00 UK, £66.25 EU, £69.00 World. Including tracking & insurance. Clara 2 Direct Conversion Receiver. Single band design, can be configured to work on 160m, or 80m, or 40m, or 30m, or 20m. High stability Hartley VFO. 12/13.5V DC operation. PCB kit £29.00 UK, £35.00 EU, £35.50 world. Box kit £64.50 UK, £74.00 EU, £78.00 World. Box built £86.50 UK, £95.25 EU, £99.25 World. Includes tracking and insurance. PESKY RX101. A single band 20m PSK receiver as a further development of the RSGB Centenary Receiver and the Sudden Receiver, with new bandpass coupled front-end filter and bipolar RF stage. The full historical development of this receiver from its 1st version in 1989 to the present day was the subject of Doing It By Design in PW in July 2014. The receiver connects between the aerial and the computer and should prove an ideal companion for the Raspberry Pi computer. Pesky RX101 PCB & parts kit £23.75 UK, £25.75 EU, £26.75 World. Box & hardware and PCB kit £34.75 UK, £38.75 EU, £39.25 World. Ready built Receiver £48.75 UK, £53.25 EU, £54.25 World. TRIBAND PESKY RECEIVER. A superhet receiver for the 80m, 40m, & 20m PSK31 frequencies. DC switched front-end filters and crystal oscillators, 4-pole ceramic 455kHz filter, TCA440 main receiver IC and LM386 audio output IC. Board size 117x81x15mm. Boxed unit 150x100x75mm. PCB kit £58.75. PCB built with rotary switch and gain pot £85.00. Box kit complete £95.00. Ready built £134.50. 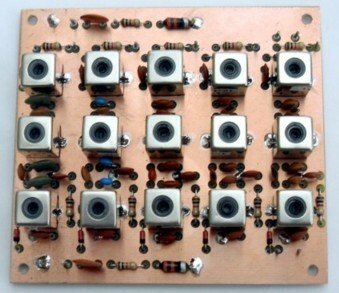 VHF PREAMP PCB, for inclusion into a receiver or transceiver. It can be configured for any spot frequency in the range 40-200MHz. Narrowband types have a typical gain in excess of 20dB. Broadband versions have gain at the band edges of 9dB or more, and mid-band around 15dB. Supply 9-15V at 5-10mA. Size 42x19x14mm. Stock frequencies 50-52, 70-71, 118-137, 137-138, 144-146, 156-162, 162-163MHz. PCB built £14.50 UK, £15.50 EU, £16.50 World. Station type for 12/13.5V operation. These replace the Garex Preamps, which had provision for a PP3 battery. Narrow band types with typically 25dB gain, Amateur 50-52MHz, 70-71MHz, 144-146MHz; Weather Satellite 137-138MHz; AIS 161-162MHz. Wideband types with 9dB at band edge and up to 16dB mid-band, Airband 118-137MHz, Marine 156-162MHz. HF-UHF 5-500MHz. Two part stove enamelled box with choice of BNC, F, or SO239 connectors. Supply requirement 12/13.5V at up to 10mA.Ready built UK £43.50, EU £48.00, World £49.00, including tracking and insurance. VHF RECEIVE PREAMPS, Station type mains powered. Uses the same preamp board as the 12/13.5V station version with same frequency choices and gain. ABS box 101x77x41mm usually supplied with BNC sockets for ANT and RX. Supplied with 1 metre mains cable with plug fitted. Ready Built £63.50 UK, £72.60 EU, £76.60 World. Prices include tracked carriage. VHF RECEIVE PREAMPS MASTHEAD, with station box for internal 9V (PP3) or external 12/13.5V operation. Masthead unit in grey heavy duty waterproof ABS box 82x80x55mm with stove enamelled fixing plate and large releasable tie-wraps. Preamp board the same as used in the station preamps with same choices of frequency and gain. Station ABS box 75x56x25mm normally fitted with BNC connectors for ANT and RX. Ready Built £58.50 UK, £67.25 EU, £71.25 World. Prices include tracked carriage. Picture coming soon VHF RECEIVE PREAMP MASTHEAD, with mains powered station box. Masthead unit in grey heavy duty waterproof ABS box 82x80x55mm with stove enameled fixing plate and large releasable tie-wraps. Preamp board the same as used in the station preamps with same choices of frequency and gain. Station ABS box 101x77x41mm normally fitted with BNC connectors for ANT and RX. Supplied with 1 metre mains cable with plug fitted. Ready Built £87.75 UK, £96.75 EU, £100.75 World. Prices include tracked carriage. DUAL PEAK/NOTCH FILTER with audio amplifier. This unit plugs into an extension speaker socket of the HF receiver or transceiver and produces 500mW of audio to a front facing loudspeaker. It can be used to notch out two unwanted heterodynes, or just one while enhancing the wanted audio frequency. Similarly it can be used to sharpen otherwise dull audio or to dampen shrill audio. PCB kit and all the hardware with drilled and labeled box £84.00 UK, £93.00 EU, £97.00 World, includes tracking. Ready built £129.00 UK, £135.00 EU, £139.00 World. Prices include tracking & insurance. CW or SPEECH PEAK FILTER, uses a Wien Bridge as a peak filter with high Q to provide a narrow audio passband centred on 700Hz for CW or on 1000Hz for speech. Plugs into an extension speaker socket of a receiver or transceiver and provides up to 0.5W into an 8 Ohm speaker. PCB kit £16.00, PCB built £24.00. Boxed unit in ABS box 123x83x59mm with loudspeaker and hardware in kit form £36.00, ready built £56.00. LS AUDIO FILTER a unit to plug into the speaker socket of any communications receiver or transceiver uses active high pass and low pass filters to limit the audio range to within 300-2500Hz then re-amplify the audio and provide up to 0.5W into an 8 Ohm extension speaker. PCB size 60x48x15mm. Box size 110x60x31mm. PCB Kit £16.00, PCB built £24.00. Boxed unit in ABS box 123x83x59mm with loudspeaker and hardware in kit form £36.00, Ready built £56.00. 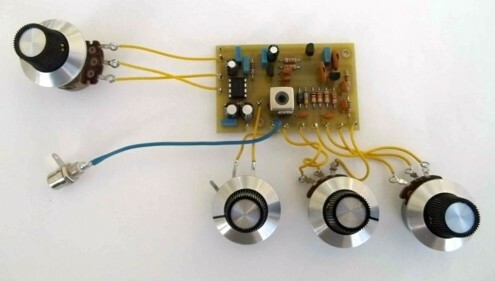 ACTIVE AUDIO BANDPASS FILTER. This uses an active high pass and low pass filter to limit the audio range to within 300Hz to 3kHz for microphone or post demodulator filtering. It is designed as an add-on board for existing equipment. PCB kit £7.00. RECEIVE CONVERTERS add 2 or 4 or 6 metres to a receiver tuning 28-30MHz, Types RC2-10, RC4-10, RC6-10 have 15dB gain a noise figure about 1.5dB. This design was put into production in November 2001 incorporating a diode ring mixer together with an improved oscillator and multiplier circuit. The Boxed version has panel adjustable gain, on/off switch and power LED. Fitted with SO239 connectors and has 1metre of lead for 13.5V bench power input. PCB size 95x45x17mm, Box size 102 x 84 x 40mm. Types RC2-10, RC4-10, & RC6-10. PCB kit £36.00 UK, £40.00 EU, £40.50 World. PCB built £49.00 UK, £53.00 EU, £53.50 World. PCB & hardware kit £63.25 UK, £71.50 EU, £74.25 World. Ready built £86.00 UK, £93.75 EU, £96.50 World. Prices include tracking & insurance. RECEIVE CONVERTERS add 4, 6 or 10 metres receive to a 2 metre transceiver. These are low noise using a mosfet RF & mixer stage and have 15dB gain. The Boxed version has panel adjustable gain, on/off switch and power LED. Fitted with SO239 connectors and has 1metre of lead for 13.5V bench power input. PCB size 89x45x17mm, Box size 102x84x40mm. Types RC4-2, RC6-2, RC10-2. PCB kit £36.00 UK, £40.00 EU, £40.50 World. PCB built £49.00 UK, £53.00 EU, £53.50 World. PCB & hardware kit £63.25 UK, £71.50 EU, £74.25 World. Ready built £86.00 UK, £93.75 EU, £96.50 World. Prices include tracking & insurance. PORTLAND VFO, a rock stable FET VFO for 6.995 - 7.205MHz for a direct conversion for the extended 40metre band, or 7.900 - 8.400MHz for use as part of a mixer VFO system as local oscillator on 70.000 - 70.500MHz band, or 5.0-5.5MHz for 20m and 80m rigs with a 9MHz IF. Now includes upper band edge adjustment, and meets the requirement for the Intermediate License VFO project. The Buffer (2A), mounted on the rear of the box, delivers 1.6V p-p into 50 Ohm with second harmonic 40dB down. Drilled Box and PCB kit with potentiometer and feedthroughs £35.00 UK, £39.50 EU, £40.00 World. Ready built £46.00 UK, £50.00 EU, £51.00 World. Prices include tracking. State required frequency when ordering. TOP BAND AM RECEIVER. Tuning 1.82 - 2.00MHz. The package includes a preselector PCB kit, a main board kit and a high stability boxed VFO. The main board has a receiver IC with S meter output, a 4 pole 455kHz IF filter, and a 500mW audio amplifier IC. The VFO comprises an oscillator board, a buffer board, a 25pF C804 Jackson capacitor, and RFI screened VFO box. Price for the complete kit package is £78.50, including tracked carriage. 1W IC AUDIO AMPLIFIER. A handy audio output stage using a TBA820M with a gain up to 48dB, 0.5W into a 8 Ohm load, low quiescent current, and low noise. Article in PW March 2006. PCB Kit £9.00. SYNTHESIZER CONVERSION CB to 10FM. This board is suitable for UK CB rigs with LC7136/7 or TC9119P PLL ICs. Puts the rig onto 29.31-29.70 MHz. State rig type when ordering. PCB size 64 x 40 x 17mm. Type SC29. PCB Built & aligned £32.50, including P&P.